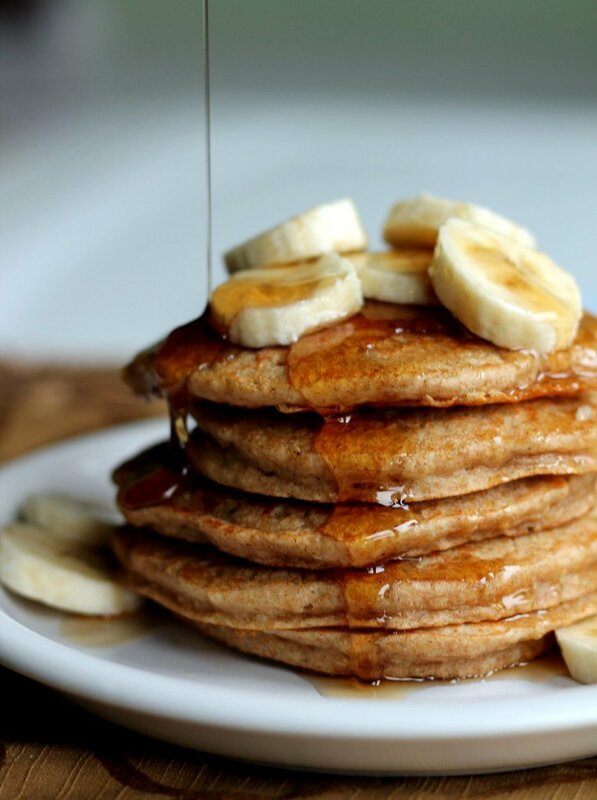 Mmmm banana pancakes. With quinoa. Quinoa is one of my favorite grains. I mean what’s not to love? 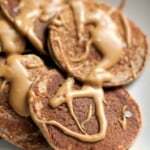 It’s versatile, gluten-free, protein packed, and the nutty flavor delivers every single time. 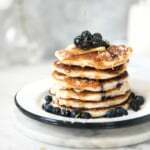 Remember my lemon blueberry quinoa pancakes? They’re my absolute favorite. I devour them in 5.6 seconds everytime I make them. Can you tell I’m a fan? I could be the quinoa spokeswoman. I wish I would have had these pancakes today before I did three hours worth of yoga this morning. I was aching for these through every downward dog and warrior two. Then guess what happened? I got pulled over (for the first time ever) after leaving class. Apparently I went through a red light. Seems I was distracted with the thought of delicious quinoa pancakes in my belly. Thankfully the police officer didn’t give me a ticket. He was surprisingly nice – I’m guessing because I looked like a hot sweaty mess who was about to eat her own arm. Once I got home and I devored these like I was a contestant on the biggest loser who hadn’t eaten in weeks. A little absurd. I even paired each pancake with different flavor toppings because who doesn’t love a little variety? One had maple syrup and bananas (classic), another had raspberry jam and toasted coconut (so so so goooood), and finally my favorite: mini chocolate chips with peanut butter (love the banana, chocolate, and peanut butter combo). I recommend trying out some different toppings. But SERIOUSLY, these pancakes are actually good for you. If you’re trying to eat more whole grains, or if you are looking for a healthier breakfast, then I think you should give these a try. I love making pancakes and then throwing them in the freezer. They’re incredibly easy to heat up in the microwave and take to go. Just spread with a little healthy topping and devour! Okay… one last bit of news! I’ve decided to restructure my blog a little bit. I will now be focusing on healthy, creative recipes. Of course you’ll see the occasional cupcake and brownie, but generally less sweets and more good eats. In my own life, I try to eat healthy and balanced and love sharing my passion for health with others. In a medium bowl, whisk together quinoa, flour, cinnamon, baking powder, and salt. In another medium bowl, whisk together egg whites, yogurt, milk, vanilla, and brown sugar until smooth. Add egg mixture to flour mixture and whisk to combine. Add pureed bananas and mix until just combined. Makes about 10 pancakes. Top with peanut butter, maple syrup, fruit, or chocolate chips. 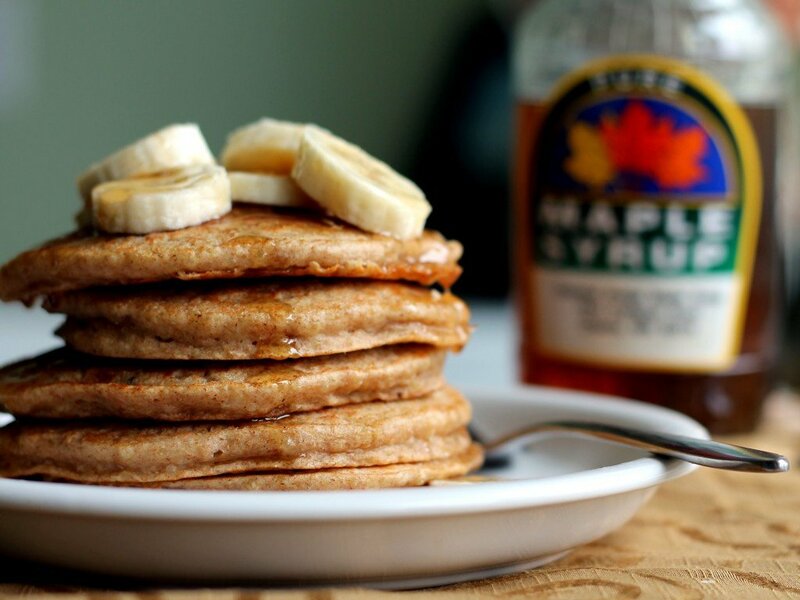 99 Responses to "Whole Wheat Banana Quinoa Pancakes"
Camera is paying off–your cover pancake picture is phenomenal! Can’t wait to try these. Tonight for a quick sweet LF treat after your awesome spicy stuffed peppers we had smores-light & right….1 sheet cinnamon graham cracker, 1 Tbls marshmallow puff, 5 dark choc chips- (I use about 60-70% cocoa chip) micro about 20 seconds–awesome ness in a perfect portion size! Happy Eating. This looks delicious! Any idea on the nutrional values? 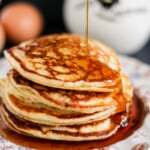 I think that you could estimate each pancake to be 90 calories each, if you are making around 10. Agreed. I love making pancakes healthy, but still delicious! I am super excited about this pancake. I was lucky to eye it while I was looking for my submission funnily enough on FoodGawker :). So glad I found it…love to use quinoa! Gorgeous photo by the way. Thanks Nicole, you’re too sweet! What’s your blog? LOVE IT. Quinoa is my soulmate. looks delicious. i’ve never cooked with quinoa yet, can you believe it. I have a jar sitting in my kitchen, but I just never go to it. I need to start trying out new dishes. i love how you used quinoa in the batter… super healthy. Oh you really do have to try it. It makes the pancakes super moist! Monique, you had me at whole wheat banana. Honestly, these look incredible. 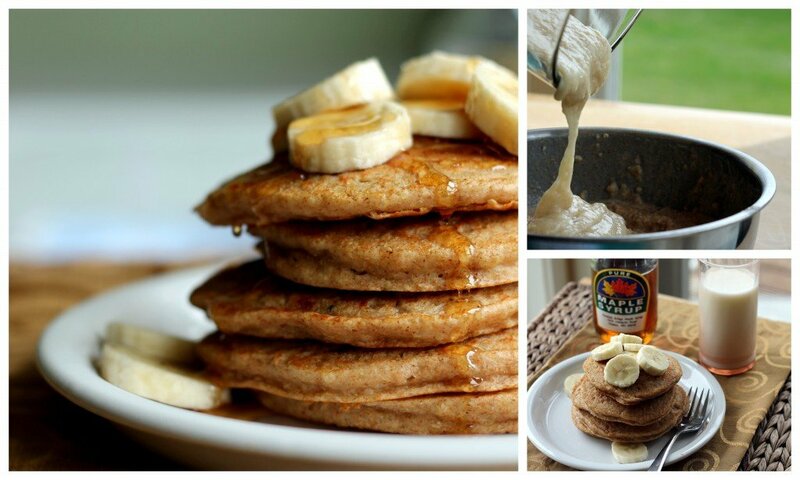 I’ve never used quinoa in pancakes, but I’m definitely going to give it a shot now! Thanks for sharing! 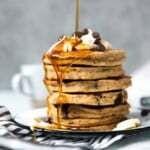 Wowza, these pancakes look amazingggg! 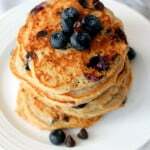 I love that you added quinoa to the pancakes – I bet the texture is fab! Thanks for sharing. Just wondering if whole eggs are also ok to use as I have a 2 year old that needs the fat in his diet. Thanks! Of course! I just put egg whites in as I like to top my pancakes with LOTS of peanut butter (which has a ton of healthy fats). I recommend using 1 egg + 1 egg white. Thanks! Thank you so much for this recipe! I had to modify mine a bit since we were out of bananas, so I tried it with applesauce – so yummy and filling! I put the modified version here and linked back to you. These were absoultely incredible! I have never baked with quinoa before, but I finally figured out how to cook it properly so it’s nice and fluffy and not bitter, and I was looking to try something new. I loved them so much I immediately made a second batch just to throw in the freezer for rushed mornings! Thanks for sharing! Hey there! I’ve been lurking on your blog for a while and just tried these pancakes out last week. Not only are they AMAZING, but for a vegetarian living with a house full of allergy ridden people/gluten free people, these are perfect. A success with everyone! Not to mention they hold up really well in the freezer and are an awesome breakfast before work any day of the week. So great to hear. Thanks for reading! I just made the pancakes and they were delicious! I love this recipe! A few months ago, I was looking for something like I had eaten at True Food Kitchen, called banana quinoa Johnny cakes. I found your recipe, tried it, and my whole family adores them. My kids like the chocolate (cocoa powder added) variety, my husband and I enjoy them without. I also tried both with and without the brown sugar added and found that they really don’t need any sugar. They are wonderful! My husband asked me to make “about 500” so he can pull some out of the freezer to take with him as energy food on his Long bike rides. Thank you for this amazing recipe! Omg Michelle! I love True Food Kitchen! Which one do you go to? What kind of quinoa do you use and how do you cook it for these? I used regular organic quinoa, either from Trader Joe’s or Whole Foods. You can cook it according to package directions. 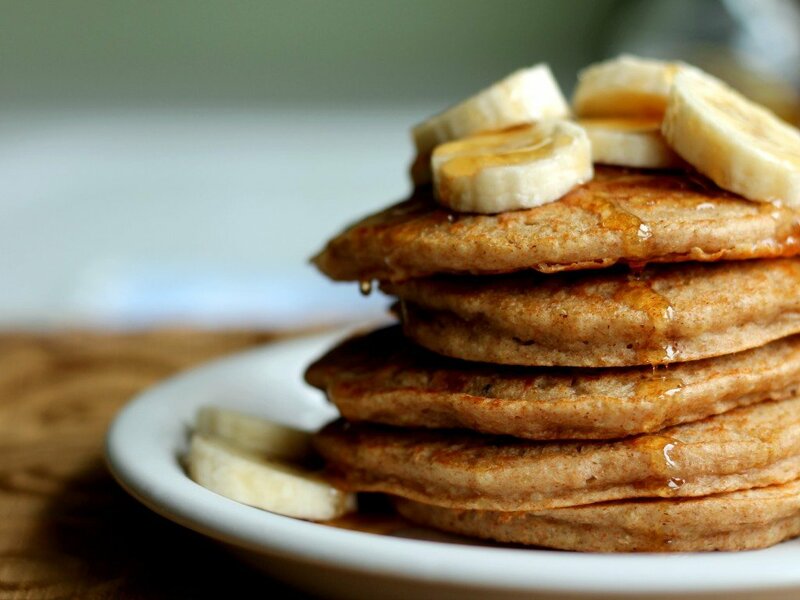 What is the nutritional value for the quinoa banana pancakes? Yum!! Made these today and they turned out delicious!! Thank you for these! 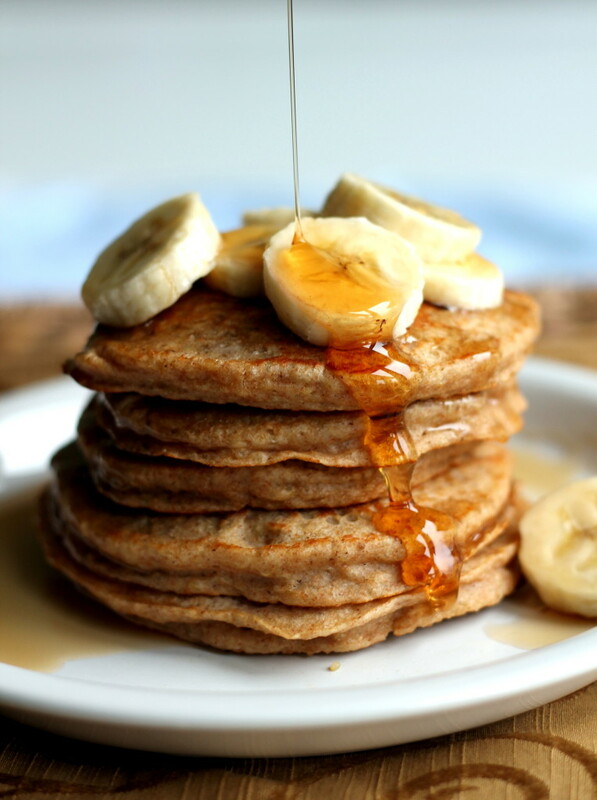 I loooove pancakes, eating them almost every Saturday (whole wheat, mind you) but would love to give these a try! They look amazing! 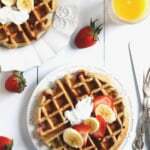 Can't wait to make this healthy, delicious -sounding breakfast this weekend- YUMM! Oh My Yummy!!! 🙂 Thanks for the post Sweet Erin! How are you? These pancakes are the BOMB! I just made a batch and ate a couple with almond butter. These will be a great pre or post workout snack. Thanks so much for posting the photos as well as the recipe! Do you think it’d be fine to leave out the greek yogurt? Thanks!! Ok, I kinda want to make everything on your blog, so glad to have found you! These look amazing and I love how easy they are! Do you have a line-up at your door at lunch? You probably will now! I can’t wait to try these. Thanks! Is there a way to make this without the eggs? Hi! I think the bananas should bind it pretty well and you could certainly try it without the eggs. Perhaps add a bit of oil; try 2 teaspoons. Let me know how it works out. Hey so I left out the eggs and they turned out really well! I’ll definitely be making these a lot more. Thanks! Hello! Do you think you could use oat flour instead of the regular flour? Yes! I’ve actually done it before. However the pancakes will be very moist. So perhaps reduce the yogurt a bit! Great – thanks so much! They look delicious! Always great every time I make them! Are the bananas essential, or can you leave them out/replace them? You could probably use pumpkin? My pancakes are coming out really mushy and not cooked all the way through. I don’t know what to do. I have even left them on the griddle for up to 20 minutes, the outside is a nice golden brown, but the insides are mushy and raw. I had trouble cooking them, and they tasted very undercooked/doughy on the inside even after spending a long time cooking them. Any tips? Huge thumbs up on the banana-peanut butter-chocolate combo. 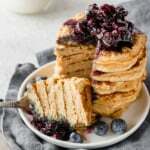 I never would’ve thought of putting quinoa in pancakes, but your recipe looks awesome and I’ll have to try it out soon! Looks awesome and just happened to make some quinoa today. But, I only have regular plain yogurt in the fridge. Do you think I can do a direct substitution? Thanks! Great recipe! I just made these today. I can never get my pancakes to turn out pretty though. Temp too high, maybe? OMG!! Just made these and they are delicious!!! hi monique! love this idea for breakfast!!! can you tell us the macros on this recipe?? Hi Monique!! Do you think I can use quinoa flour instead of cooked quinoa?